Drones are fun and can take your videography to the next level! Despite the awe you might feel when you see gorgeous aerial footage and shots produced by drones, you might feel a little apprehensive about buying one due to a number of reasons. Are they worth splashing out on? Are they hard to fly? We’ve got some encouraging news for you! Some drones are so easy to pilot, you’ll feel like a pro in no time! Everyone has to start somewhere and some drones make it a lot easier than others. And with the increase of popularity in drones, they’re becoming more affordable so the price points are realistic for budding videographers and beginners. To help you along with selecting your first drone, we’ve put together a list of our top four drone recommendations from PB Tech! 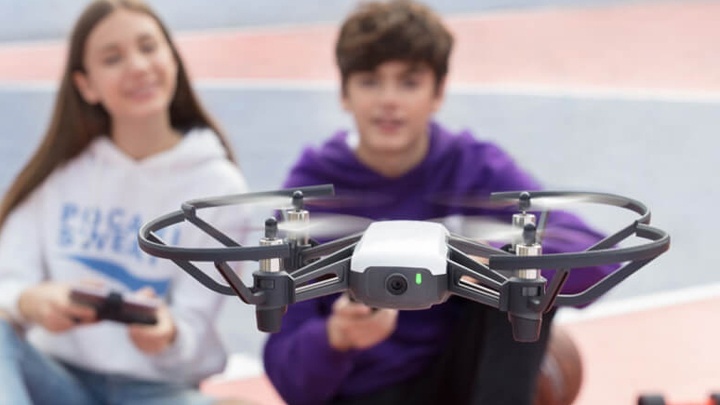 The DJI Tello comes with an affordable price tag and awesome DJI technology that makes it easy to fly, right off the bat. It's a great drone for those who just want to have fun, or to learn the basics of flight before splashing out on a more expensive drone. It’s ultra-lightweight at only 80 grams and has a durable design and blade guards so first-time drone pilots can fly with ease. 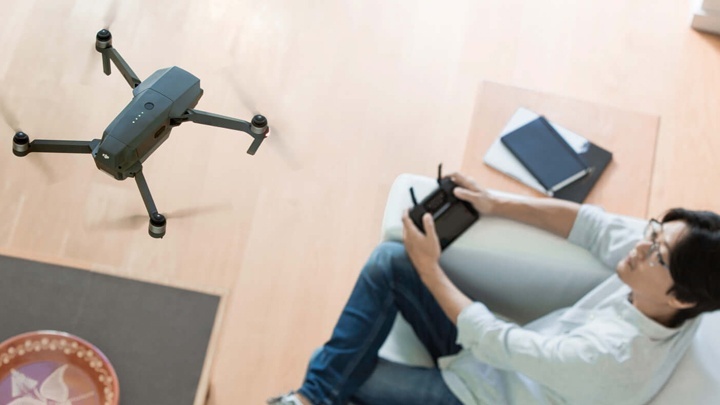 The thought of crashing your new drone can be a scary for first-time pilots, but with the Tello, you can relax knowing it comes with extra safety features so you can fly with more confidence! 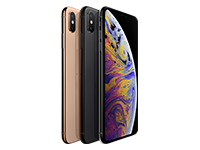 These include Auto Take-off/Landing with just a single tap; Low Battery Protection that alerts you when your battery is low; Failsafe Protection that helps you land safely, even if you lose connection; and Vision Positioning System that facilitates precise hovering. Not only was the Tello built to be easy and safe to fly, but it was also built to be a blast to fly! With awesome features like the DJI flight controller, you can perform awesome tricks with just a tap on the screen. 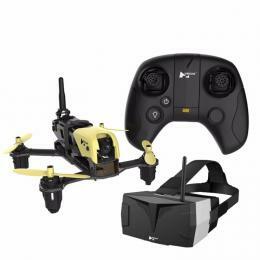 Let the drone take off and land from your hand or start the drone by simply throwing it in the air; you can even perform cool aerial stunts and 8D flips by sliding on your phone screen. So how is the picture and video quality? Remarkably good for a beginner drone at this price point! It’s equipped with a high-quality image processor and features a 5MP camera that shoots 720p video at 30 fps. Even if you’re still getting the hang of flying, you can record pro-level videos with the EZ Shots feature which lets you record coordinated short videos with Circle, 360, and Up & Away. 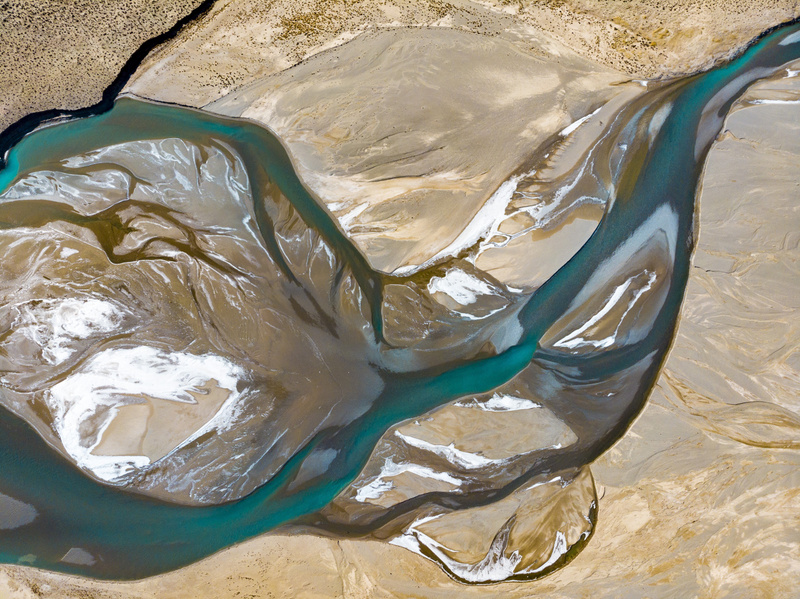 Electronic Image Stabilization also helps to ensure the aerial footage you capture is smooth and stable. 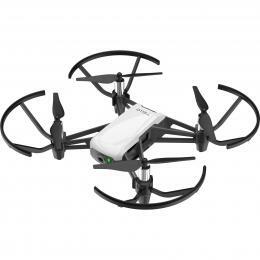 This drone is also a great choice if you’re interested in programming! Play is an essential part of learning and the Tello makes it easy for students to learn the basics of programing. It can be programmed with Scratch (an MIT-developed coding system) that allows you to program flight routines and unlock new possibilities! 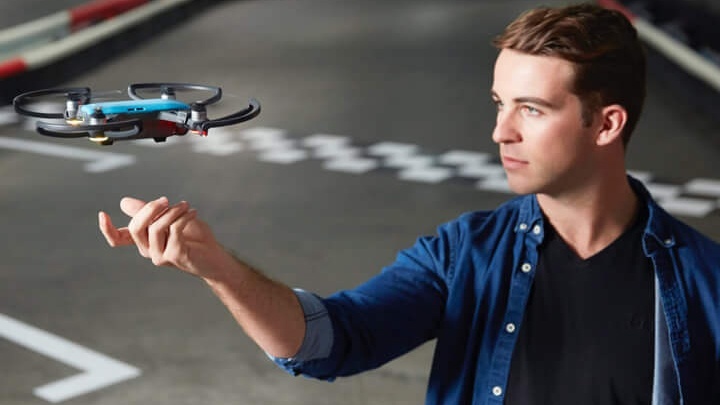 The DJI Tello is a great drone for beginners who’d like to learn the basics of flight, or even for more experienced drone pilots who are looking for a drone that’s fun to fly. The DJI Spark is the perfect starter drone for those who want a drone that’ll last and perform, without having to splash out too much. 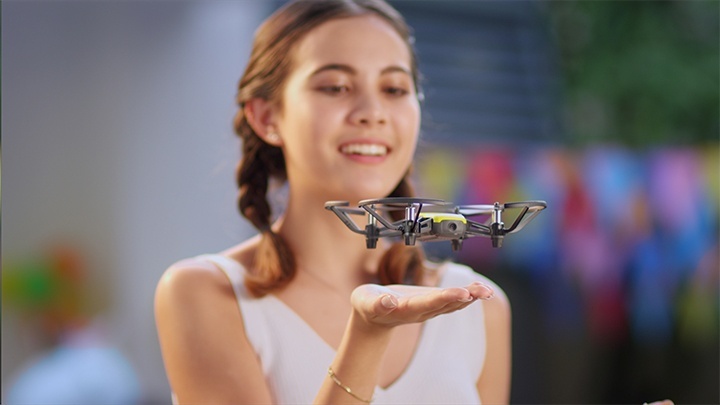 This mini drone features all of DJI’s signature technologies, allowing you to take your creativity to new heights without breaking the bank! The camera is great quality for a starter drone! The Spark features a 12MP camera and can shoot video at 1080p. With a 2-axis mechanical gimbal and UltraSmooth technology, any shake or rolling shutter effects are dramatically reduced keeping shots stable and detailed. Gesture Control - While you can control the Spark from your phone (or with a Spark controller), it can also be controlled with hand gestures. Once your drone is in the air, you can use a number of different gestures to do certain things such as video recording, beckon your Spark back, land your drone, and even take selfies. Taking a selfie with your drone (without the controller in the picture) is easy with gesture mode. With the drone in the air pointing at you, just give your drone a wave and make a picture frame shape with your fingers. 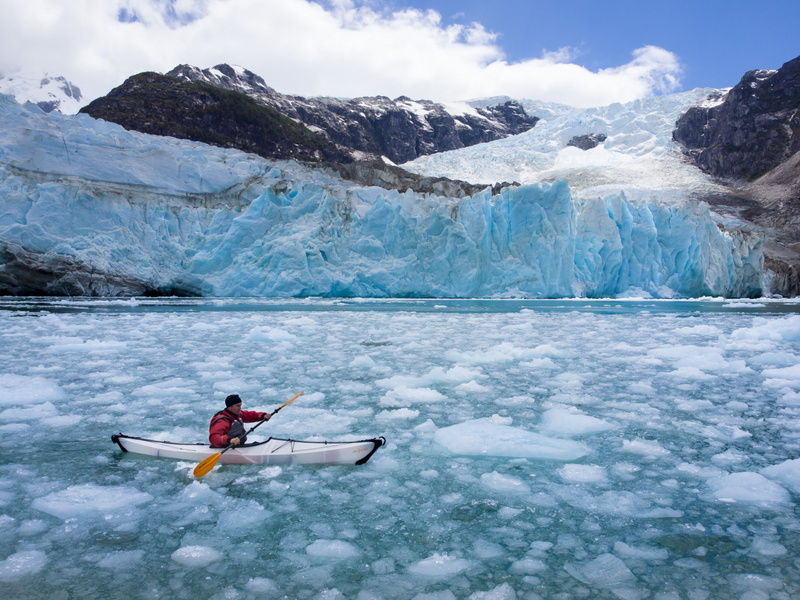 ActiveTrack – Keep filming like a pro on the move. With ActiveTrack, just tell your drone who to track and it’ll actively follow the person. Return To Home - A feature that will help to put beginner pilots at ease is the Return To Home (RTH) function. If the battery gets low, connection is lost, or you simply want to return to home, hit RTH and the Spark will fly back to the preset home point while using it's cameras to sense and avoid obstacles. The DJI Spark Drone is a great drone for beginners who want to capture great quality footage without breaking the bank. If you're a vlogger or traveller who wants to capture the most of your adventures and/or add a few cool aerial shots into your videos, you'll find great use for this drone. 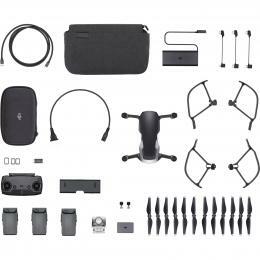 The DJI Mavic Air sits in between the Spark and the Mavic Pro, taking the advanced technology of the Mavic Pro and the small form factor of the DJI Spark to offer up one of the best consumer drones on the market. 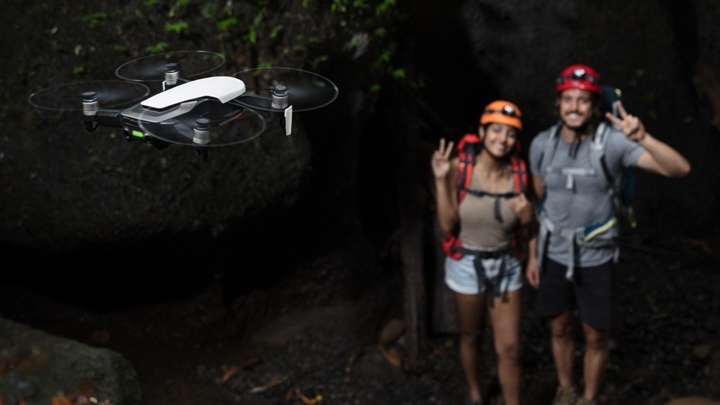 This ultraportable and foldable drone provides you with a great balance of power and portability, delivering high-end flight performance and functionality for limitless exploration. The Mavic Air features a 12MP camera and is capable of shooting incredible 4K video at 30 fps, up to 100Mbps. It has 3-Axis gimbal stabilization to help you create steadier shots. In addition to Horizontal, Vertical, and 180 degree panoramas, the Air can stitch 25 photos together to create cryal-clear 32MP sphere panoramas. 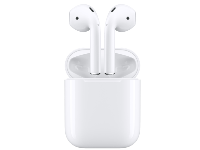 Pair them with a DJI VR headset for an immersive experience! The camera features don’t end there though – with Slow-Motion video support (recording 1080p at 120 fps), you can capture all of your epic high-speed adventures too! As with all DJI drones, the Mavic Air is easy to fly. It takes well in all but very strong winds, and moves around effortlessly. The Mavic Air has numerous practical safety features built in that can help reduce the amount of crashes a beginner pilot might experience when flying a new drone. 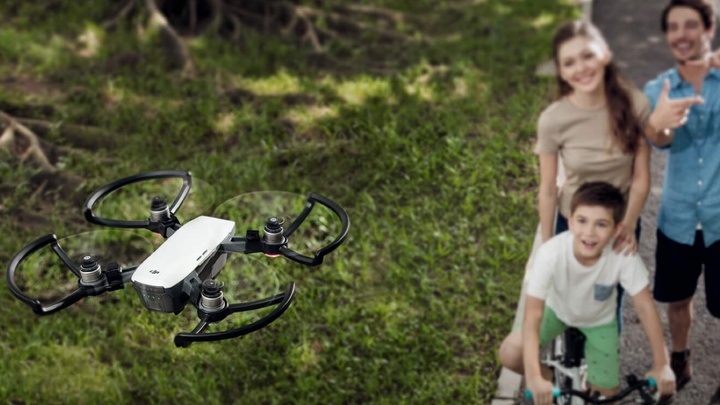 FlightAutonomy 2.0 uses the Air’s powerful vision sensing system to observe the surrounding environment and learn its orientation to achieve comprehensive protection. 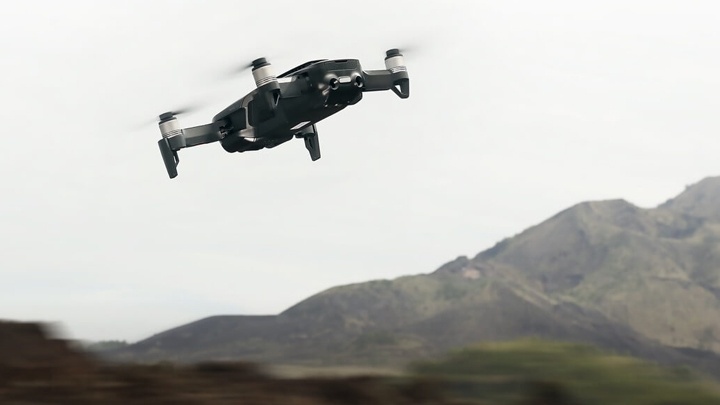 One feature of this includes the Advanced Pilot Assistance Systems (APAS) that will help the Mavic Air to avoid obstacles around in front and behind it. As you continue flying backwards and forwards, the system plans an appropriate flight path that automatically bypasses them. Other redundancies in place for safety measures include VisionCompass, more reliable Return to Home, and 3D Map Building. The Mavic Air features a handful of modes and features that make capturing awesome footage even easier! 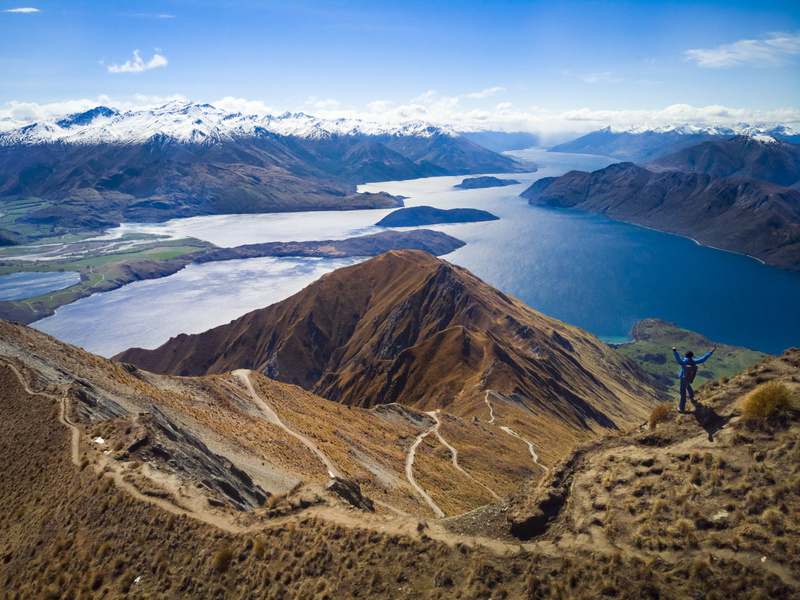 Just like the Spark, the Mavic Air features ActiveTrack, but with higher tracking precision and broader scenario applications, following subjects even when they’re running, jumping, or cycling. The QuickShots feature allows you to choose from six different QuickShots – Rocket, Dronie, Circle, Helix, Asteroid, and Boomerang. 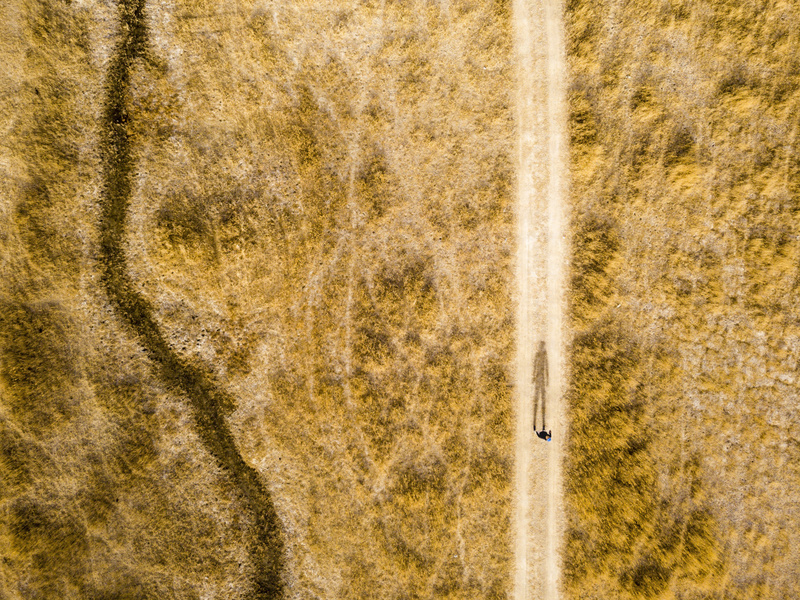 With a tap of a button, your drone will take care of that epic zone selfie shot for you. The Mavic Air is truly one of the best consumer drones you can get that is easy-to-use and with great features and image quality. It’s one step up from the Spark, which is a great starting point if you’re okay with 1080p images. 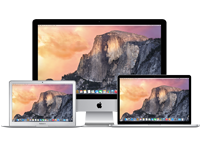 However, if you want greater features and sharper shots at a higher resolution, the Air is the way to go. Check out these awesome shots taken on the Mavic Air! Although the price point is higher than other drones on this list, the iconic DJI Mavic Pro totally deserves a spot here due to the fact that it’s such an easy drone to fly! 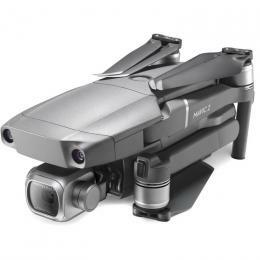 It offers great flight time, long-range remote control, live video feed to your smartphone, and fantastic 4K video footage in a brilliantly portable and easy-to-use package. This small yet powerful drone allows you to turn the sky into your creative canvas easily and without worry! The first thing you’ll likely notice about the Mavic Pro is its small size (considering the expectations you’d have for a drone at this level). It’s small enough to throw into a pocket on your backpack or even your purse. With its small size and level of portability, you might be wondering if it lacks in other areas such as image quality and flight stability… Let’s get onto that (spoiler alert: it doesn’t!). Despite the size, the Mavic Pro has high-quality camera capabilities that lets beginner pilots capture professional grade shots with ease! 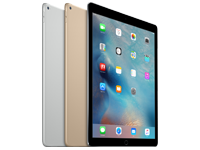 It can capture 12MP stills in JPEG or DNG RAW format, and shoot up to 4K at 30 fps to provide ultra-sharp and clean footage and images. It is stabilized by a 3-axis mechanical gimbal for super smooth and stable aerial shots. 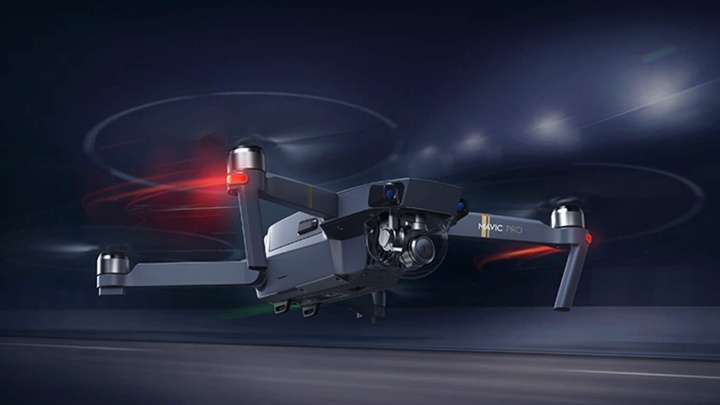 While image and video capture is likely your biggest point of interest, you should be pleased to know that this drone comes with four other cameras on board that aid in-flight stability and safety so you can fly with confidence. The additional cameras help to keep the drone from drifting in areas of poor GPS coverage, and to prevent collision with obstacles, so the chances of your drone crashing into a wall or a tree reduce significantly (though the great build quality and durability of the drone provides extra insurance against that too). Beginner Mode – Since this article is about drones for beginners, we thought this feature is worth mentioning. Beginner mode is designed specifically for novice pilots and places restrictions on how high and far you can fly, meaning you don’t have to worry about losing sight or control of your drone. Tripod Mode – If you’ve become comfortable in beginner mode, you can graduate to Tripod mode. This mode is designed to reduce flight sensitivity to create the most stable video capture possible. In this mode, every move the Mavic makes becomes slow and precise. Terrain Follow – This feature uses a Downward Vision System to maintain a consistent level distance from the group. That means you don’t have to worry about flying too low as the system will keep you at just the right height – even over uneven terrain. The DJI Mavic Pro is one hell of a drone packed with awesome features and excellent quality image and video capture! If you're a beginner who wants to start getting those professional-grade shots right now, and you have a little bit of extra cash to spend, consider the Mavic Pro! So there you have it! The top four drone picks for beginners at PB Tech. Check out these drones alongside the rest of our range in the PB Tech Aerial Image Drones department. Make sure you keep an eye on our Tips and News section to stay up-to-date with the latest on what we have to offer!